This rolling '23 frame is a standard frame with rear axle kick only. 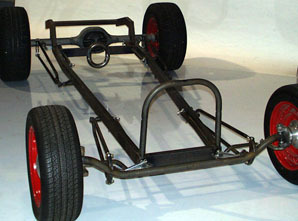 This works well for lightweight cars (four bangers) when you don't need the additional body depth and legroom created by a DZ frame (double Z'd). The design concept of the DZ frame is to be able to set the body on top of the frame, not giving up precious passenger compartment room. 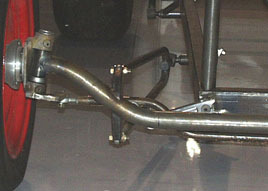 They feature a kick at the firewall to get the frame above the suspension, and a kick at the rear axle. The frames are contoured to fit the body and maintain the maximum width possible. 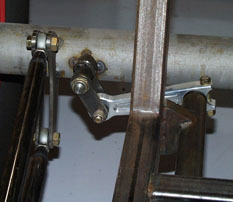 Rear frame horns to extend the full length of the body are standard. P/N: 23FKS: Not shown. This 16 piece kit has all of the tubes shown above, in rough cut blank lengths, for those who want to have the satisfaction of doing most of the work themselves. Purchase this kit with a drawing package which includes full size drawings of many pieces and all of the angle cuts. You cut the tubes to match the drawing, using the drawing as a gage to check your work and then weld it at home. P/N: 23FKM: Shown above, same as above except all of the individual tubes are precision machined on our CNC machining centers, deburred and ready to weld. Use your garage floor to weld the frame together on, or for the ultimate in convenience, precision and flatness, purchase our portable welding jig. P/N: 23FKW: Welding not your bag, no problem. We can fix you up with the frame completely TIG welded on our two ton cast iron jig … it doesn't get any flatter than that. P/N: WF1: Not Shown. This compact, portable welding table / jig will be available soon to allow you to have the ease of working at bench height to clamp and weld our frame kit with precision and repeatability unavailable on the garage floor. Packages available to fit '27 bodies. 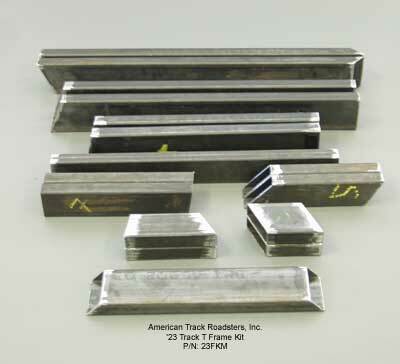 Our Hairpin radius rods have a graceful taper extending to the 6" rod end centers. Available in 30" or 36" lengths. Made from 7/8 * .120 wall 4130 Chromoly tubing. Tie rod arm. 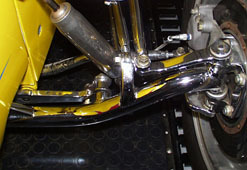 ½" flame cut 4130 Steering arm. ½" flame cut 4130. The gentle bends of this mandrel bent 1 3/4" 4130 axle gives a surprising 4 ½" drop, but looks like much less. We like old racecars and we like racecar parts. Torsion bars are true to '40's and '50's Indy cars, torsion bars are perhaps the most simple suspension available, yet a mystery to most people. Torsion bars are competitively priced with other suspensions and offer great handling, good ride, and the cleanest appearance available!